One of my favorite Greek wineries to visit in Northern Greece is Alpha Estate, the primary producer in the small, ancient Amyndeon (ah-meen-thee-on) appellation. Led by winemaker and friend, Angelos Iatridis, Alpha is the most innovative and technologically advanced winery in Greece, plus they have a petting zoo! All of their wines are super amazing, but what I want to highlight in this post are the unique vineyard and winery technologies they employ to ensure not only ‘precision viticulture’ but also ‘precision winemaking’. I also included a quick update from Angelos on how the 2015 harvest is shaping up! 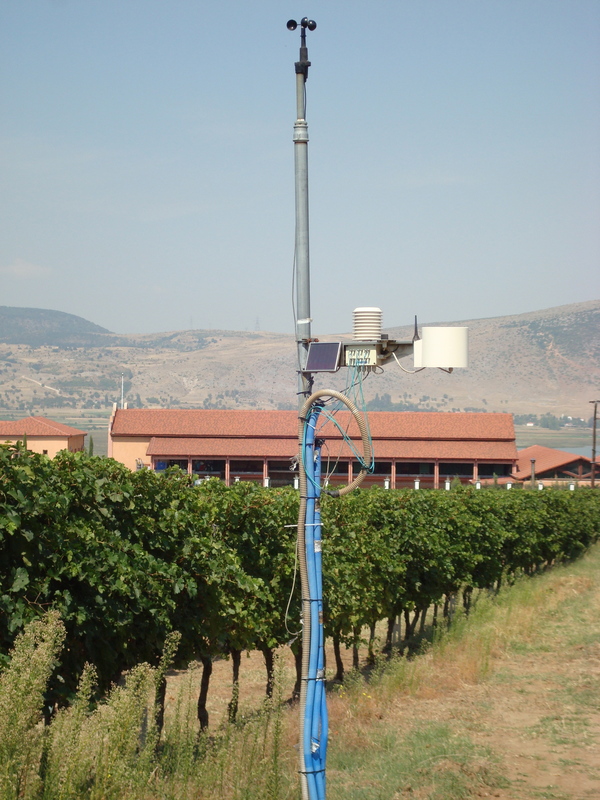 There is a weather station situated within the vineyard that helps to predict the next 10 days of weather. Combined with the irrigation system, Angelos and his team can really employ “proactive” farming and understand exactly when they need to irrigate. Alpha Estate uses the WorldView-2 earth observation satellite (fancy!) to follow the ripening progress. The satellite sends multi-spectral images of the entire vineyard and each block back to the winery. Based on the differences in the vigor imprint among vines, Angelos and his team can determine if they need to selectively harvest within a vineyard block. How cool is that! …And continues in the winery. If I didn’t mention this before, Alpha has 87 separate vineyard blocks growing over 13 varietals. 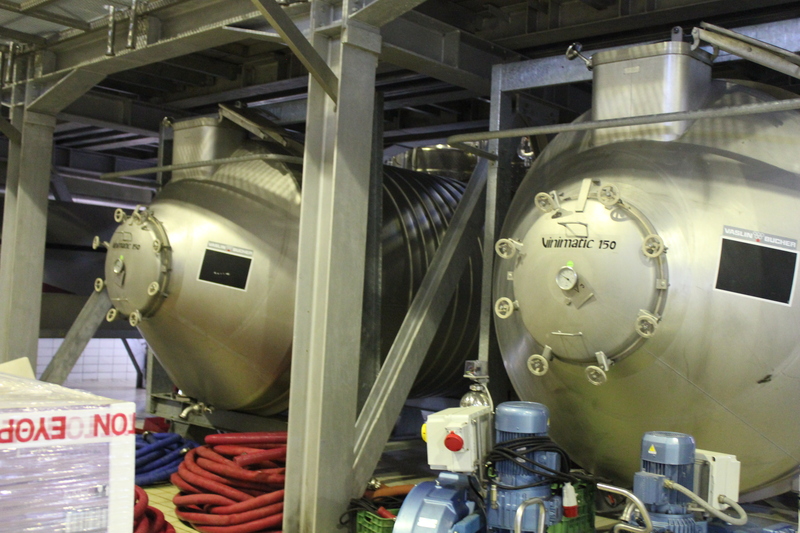 They also have 87 separate tanks in the winery in order to specially treat each block during fermentation and ageing. 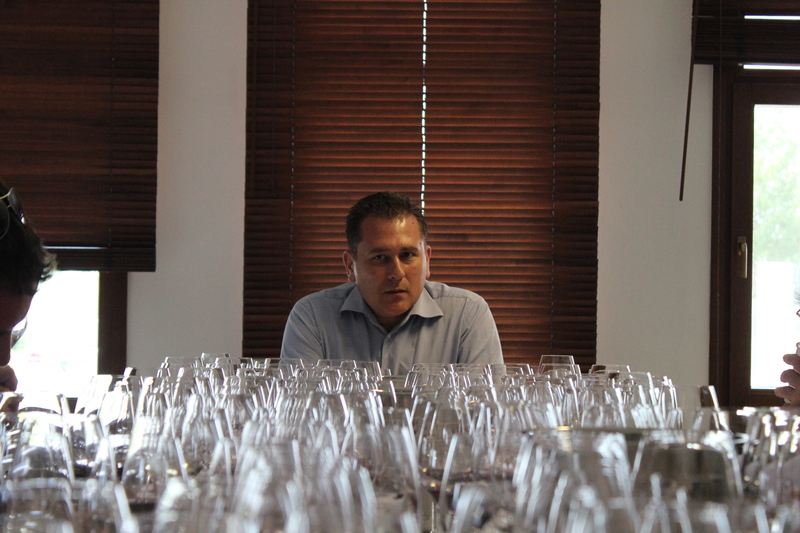 Alpha is one of the only Greek wineries that can do sample analysis on up to 42 different blocks at the same time. 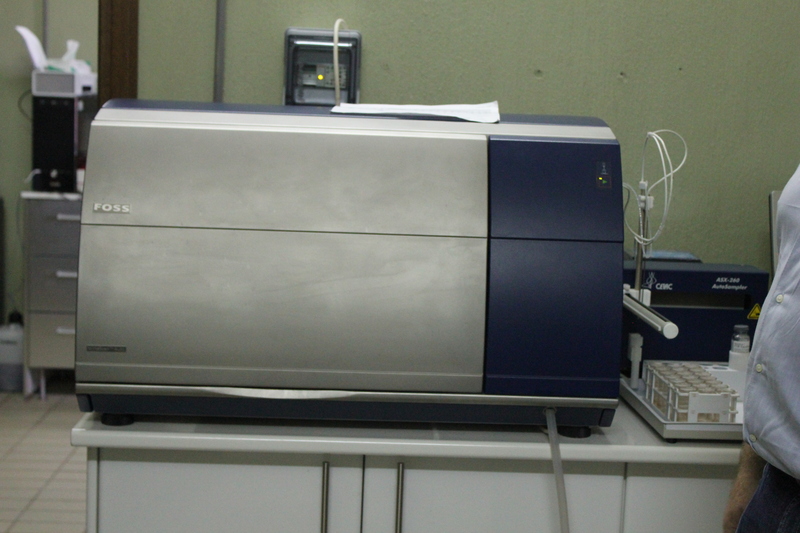 This Autosampler allows them to measure 19 different components of each block. They can also analysis competitors’ grapes should they obtain access. After all this investment and precision, you don’t want to mess anything up. To ensure no contamination happens throughout the winery, Alpha uses wood stains composed of food oils for their wood ceiling and baseboards, colors for the walls derived from paint mines, and wooden crates from France built from stone pine to prevent infection. So even if you haven’t tasted the wines (yet! ), it should be obvious now why Angelos and his team have achieved these amazing accolades! I am sure by now you want to try some of Alpha’s gems. Led by Ted Diamantis, Diamond Wine Importers are the lucky folks who bring their wines into the US and who is also responsible for introducing me to Angelos and his team. (Thanks, Ted!) You can visit them at www.diamondwineimporters.com to find out the distributor in your state who carries the Alpha wines. I just spoke with Angelos about harvest and he offers this fresh-from-the-vineyard report! “Some great harvest news from Greece! We are extremely happy with how this vintage is playing out and we are looking forward to finishing harvest in the next few weeks. 2015 was a cool vintage with low overall rainfalls between April and September, second lowest in the last six years. Winter wasn’t too cold so the soils were able to restructure properly. The vines were growing at a reasonable pace in May and dry weather allowed for nice flowering. Around the second week of June, the weather turned a bit colder and more rains led to disease risks and very vigorous growth, but we were spared any problems. Any vineyard that hadn’t finished bloom started to struggle in order to finish flowering. The biggest concern in the vineyards this year was to limit the vigor of the vines due to the large amount of June rainfall. 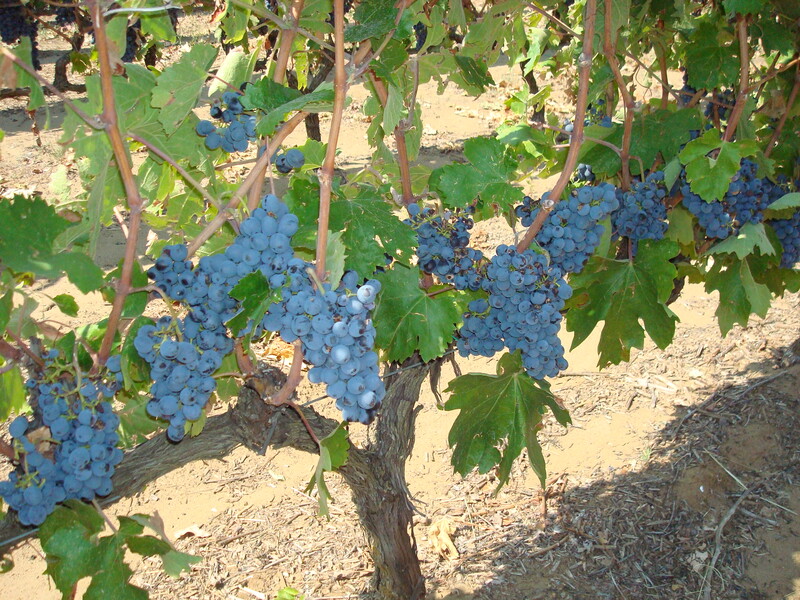 Cover crop and green harvest practices during veraison were used to achieve excellent balance of the vines. What is an achievement for this vintage is that the same varietals with the same sun exposure and vine age ripened at the same time. Perfect weather conditions followed veraison, including excellent nocturnal temperatures, which helps develop a crispy acidity and a high aromatic potential for the white grape varieties. καλή τύχη και Συγχαρητήρια, Angelos! This entry was posted on September 16, 2015 by Lisa Stavropoulos in Uncategorized.